The Deepwater Horizon oil spill directly impacted birds and their habitats at an unprecedented scale within the Gulf of Mexico. Early efforts to determine pre-spill baseline conditions for avian resources highlighted the lack of adequate data to inform decision-makers, as well as the lack of any comprehensive, integrated approach that would permit evaluation of realized damages or response to future on-the-ground restoration efforts. However, this environmental disaster has also resulted in an equally unprecedented focus on the Gulf ecosystem and resources to support its restoration and recovery. Designing a coordinated, integrated, and collaborative avian monitoring program for this system has many challenges: (1) the scope and scale of the Gulf ecosystem and (2) the number of partners, stake holders, and required expertise; and (3) the amount of funding required to successfully design and implement a Gulf-wide avian monitoring program. Yet meeting this challenge is imperative to understanding population trends and cause and effect relationships that underscore demographic process that drive trends; as well as providing a basis for judging success of Gulf restoration efforts. Birds are a remarkable natural resource within the Gulf of Mexico. They occur across a variety of habitats and ecological niches across this region. Barrier islands, beaches, marshes, coastal forests, and the open ocean support hundreds of species and millions of individuals. Colonial-nesting waterbirds feed near the top of the food chain in shallow water, whereas overwintering shorebirds forage on mudflats and beaches, and secretive marshbirds forage in marsh grasses at the interface of open water and land. Twice a year, coastal habitats provide essential stopover sites for millions of Neotropical migrant songbirds and serves as one of the most important areas for wintering waterfowl on the continent. Yet coastal habitats are increasingly stressed by a variety of anthropogenic activities and natural events that are often at odds with birds and their use of these habitats. Stressors such as land development, oil and gas activities, hurricanes, sea-level rise, degraded water quality, and pollution can fragment and reduce habitats in sensitive coastal ecosystems. Quantifying the magnitude of these impacts as well as evaluating contemporary restoration and management actions is a critical but complex and challenging task given the scope, scale and inter-connectedness of the Gulf ecosystem. maximize the integration of surveys across agencies and organizations. Recognizing the need to incorporate additional stakeholders, partners, expertise and a more formalized means of coordinating and integrating avian monitoring activities across the Gulf of Mexico, the initial working group has evolved into the Gulf of Mexico Avian Monitoring Network. 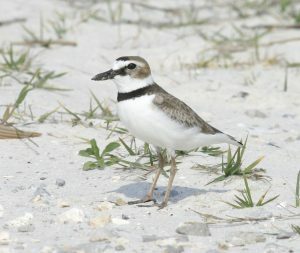 The Network aims to provide a forum by which conservation partners can collaborate and implement a coordinated monitoring system that recognizes and builds upon established monitoring programs to connect, leverage, and integrate existing efforts into a comprehensive Gulf-wide avian monitoring program to address contemporary and long-term conservation needs of avian populations and their habitats within the Gulf of Mexico. An integrated and coordinated network of scientists and land managers provides a much needed forum to collaborate, share information and provide overall support for the implementation of bird monitoring efforts in a unified fashion, as well as, to provide a venue to ensure the most up-to-date science is integrated into conservation strategies and disseminated to decision-makers, managers, landowners, and the general public about the invaluable natural resources of the Gulf of Mexico. The Gulf of Mexico Avian Monitoring Network will provide such a forum and allow conservation partners to more efficiently and effectively monitor birds and their habitats as an indicator of Gulf restoration.